It’s not them—it’s you. 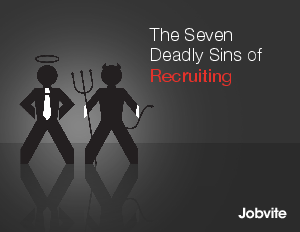 Jobvite’s new eBook reveals which common mistakes might be costing you candidates. Everything’s changing in the recruiting world. Jobs, jobseekers—even technology. The good news is that these changes open an exciting new world to you in terms of talent. You can source more strategically and hire stronger candidates. The bad news: You might have to break some bad habits first. Why there’s no such thing as “enough” candidates in a talent pool. How your employment brand can make or break you on social media. Which tactics are most likely to win you executive support.